I've been a bit demotivated for the last few days. I went out for a 6 miler on Thursday which I cut short, making it just a 3 miler, because I couldn't get myself to do any more than just shuffle along, and then didn't manage to get out at all on Friday or Saturday. I knew I couldn't let the week pass without a decent long run, and so on Saturday night found myself looking for a race to enter on the Sunday, just to give myself a reason to get my trainers on! I had a great offer of joining Emma at the Canterbury 10 miler, which I could have entered on the morning, followed by tea (and I was hoping biscuits) back at hers, but unfortunately didn't even manage to get up in time to drive down there! After such a poor week, I knew I couldn't just let it go, and had to bite the bullet and go for a long run regardless of whether I wanted to or not. So, I got my gear on, and eventually headed out of the door, with a plan to run 20 miles, during which I was also going to trial a High-5 carb drink with some High-5 gels to keep me going, from the race pack that we were given during the Brathay training weekend. From the minute I started, I didn't feel great. Lumbering might be the word ;) About a mile in, I stopped to take my coat off...it was much warmer than expected and I was cursing the long sleeve top I had on. Another mile in, the pain in my foot and shin was getting too bad to ignore, and I stopped again, realising that I couldn't flex my left foot. I took of my trainer, stretched the elastic on my sock, and spent a few minutes inexpertly rubbing my shin and ankle, trying to loosen off the tightness. It seemed to work, I relaced my trainer (less tight this time) and carried on. The next 8 miles or so were equally annoying. Aches and niggles kept bothering me, and the voice in my head kept up a tedious commentary abut how painful running was, wondering who had thought it was a good idea in the first place, and what on earth was I doing. It wasn't fun. 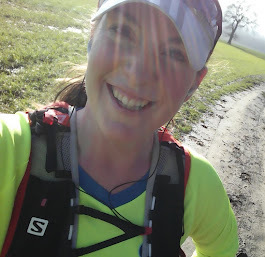 I was pretty much on the road for the first part of my run, and I don't think that helped - I've been getting much more used to cross country stuff recently, and the unforgiving (and frequently flooded) tarmac did nothing to improve my mood. After about 10 miles, things got marginally better, as there was a pavement to run on away from the traffic and I managed to lose myself thinking about something other than the run. Another eight miles or so passed relatively painlessly and I managed to get in a bit of a rhythm The High-5 products had actually worked very well. I was having a mouthful or two of the carb drink every 2 miles, and a gel every 6 miles, which kept me totally fuelled - a bit of a revelation to be honest. I've tried the gels before while drinking Powerade, and it made me feel very sick, so good to see they'll work for me if I use the right drink. I had to go and pick up my coat from where I'd dropped it off, so added a bit of a detour to my route, and by the time I eventually made it home, I'd done just over 21 miles. Once I stopped, I realised quite how painful my calves were - horrendous searing pain that I don't remember ever having had before and I felt exhausted. I laid down for a bit, then stretched, and had the final stage of my High-5 nutrition test, the recovery drink. I went up for a bath, and although it's something I never do, I ended up running the cold tap over my legs, just to try and get some relief! Luckily, the pain seemed to pass quite quickly, and before too long I was feeling pretty much back to normal. This morning, other than my knee still being sore (pass the ibuprofen gel!) my legs are fine and I'm really glad I persevered and got the miles done. It was hard to keep going but I've had loads of great motivational comments from friends on Twitter (just a few of which are below) which reminded me it was worth it! @naominf Well done Naomi, I know the feeling, I did 20 yesterday & 9 today barefoot and I am sore. These are the runs that make a finisher. 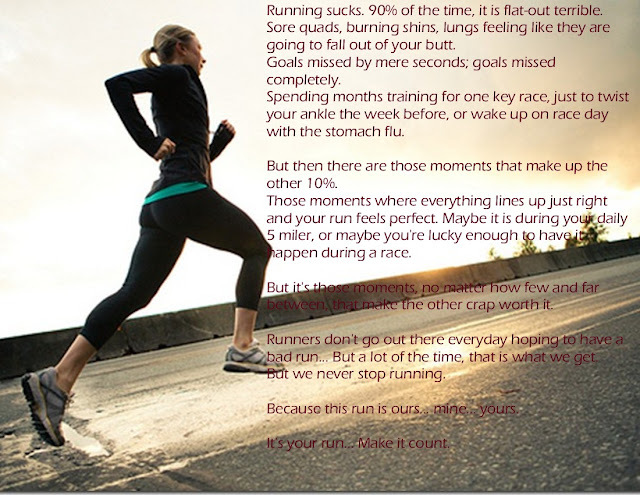 @naominf It's the horrible runs that we persevere with and don't quit that make us stronger! Well done!